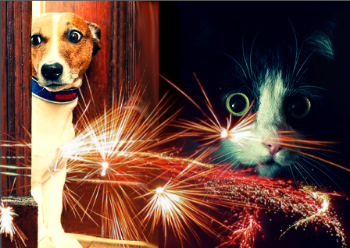 A heartbreakingly large number of cats and dogs suffer terrible fear and anxiety from fireworks displays and thunderstorms. Unfortunately, many of these pets are still given a medication called acepromazine (or as it’s more commonly called… “Ace”) in an effort to help them through these terrifying events. Truth is though, while acepromazine, a very powerful and effective tranquilizer, may make it look like your dog or cat is handling the fireworks or thunderstorm well, they are actually suffering just as much, if not more… they just can’t show you or do anything about it! Acepromazine definitely has its place in veterinary medicine, just not as a single therapy to help cats or dogs through fearful or anxiety-inducing experiences. This is because acepromazine does little to nothing to help mitigate the fear and anxiety that these suffering pets experience from fireworks and thunderstorms. What it does do though, and do well, is make them unable to move and/or exhibit any of the other outward signs of their fear and anxiety. Ace is kind of like a “chemical straightjacket” in these instances. And as if that wouldn’t be bad enough, Ace can actually increase a pet’s sensitivity to noises! Given that fireworks and thunderstorm phobias are, at their core, noise phobias, you can see where this would definitely not be a desirable effect for the drug being used presumably to treat these conditions. 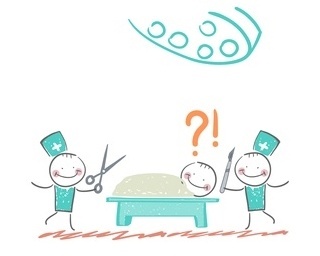 Imagine you’re on the surgical table getting ready to have one of your kidneys removed — a procedure you’re not likely excited about to begin with. Your anesthesiologist has given you a medication to make you groggy and unable to move, but hasn’t given you anything that will prevent you from feeling the pain. In fact, the medications they’ve administered may actually make you more sensitive to the pain! Is this a procedure you want to go forward with? And, assuming that you had an unlimited supply of kidneys, if this surgical procedure were to be repeated year after year (as is the case with 4th of July, Canada Day, Guy Fawkes Day, and New Years Eve fireworks) or periodically throughout the summer (as is often the case with thunderstorms), how excited do you suppose you’d be for it the next time it occurred? Is it any wonder then that pets who receive Ace for their noise phobias tend to keep needing it? Fortunately, we know more now about helping pets with the fear and anxiety that drives the signs that you often see during fireworks and other such events — the panting, pacing, “clinginess”, hiding, shaking, etc. And thankfully there are now far better alternatives — such as alprazolam or trazodone — that your vet or a board-certified veterinary behaviorist can prescribe. But they’ll need time to determine and dispense the best medication(s) for your pets, and you’ll need time to do “test doses” to determine the safest and most effective dose of the medication(s), too. And depending on when your vet or behaviorist last examined your pets, or any pre-existing medical conditions your pets may have or chronic medications they may be on, your vet or behaviorist may also need to do a current physical exam or blood/urine monitoring tests. As of 2016 there's even now a medication specifically developed and FDA-licensed to help dogs who suffer from noise phobias and anxiety from fireworks - it's called Sileo. It's a fast-acting, non-sedating gel that you put on your dog's gums to help prevent or treat their noise aversion. As with alprazolam and trazodone, Sileo is available by prescription only, and it's not appropriate for every dog. To best help your pets with their noise phobias you really need to speak with your veterinarian or behaviorist as early as possible, and especially well in advance of any expected fireworks displays or thunderstorm seasons. The 3rd of July is a horrible (and extremely busy) time to contact your vet with a “firework meds” request! And it should go without saying, but it’s important enough to say anyway… never give your pets any medication or supplement without first speaking with your veterinarian. As with other drug classes, when dealing with behavior modification medications, there can be significant undesirable side effects when drugs are inappropriately used together or when they’re given at inappropriate dosages — including Serotonin Syndrome. Everybody and every pet can have different experiences though. Please share your experiences, so we can best help dogs and dog lovers everywhere. The information you share will help many other dogs. It's anonymous and will take 2 minutes. Thanks for learning more about why acepromazine isn’t the ideal medication for helping your pets with their firework and thunderstorm noise phobias. Here is some additional information and tips to help you and your pets make it safely and comfortably through the 4th of July and other holidays and events marked with firework displays.